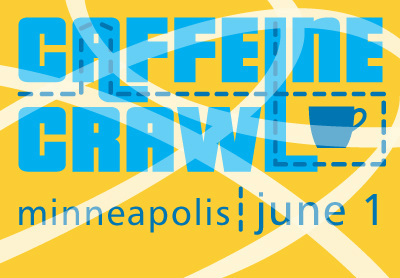 Our first Caffeine Crawl in the Upper Midwest was a success and opportunity to set the tone for future Crawls in the Twin Cities. The weather turned out to be perfect for a tour after a very long winter, and we even experienced a fast rain that quickly passed over - giving us a taste of coffee weather in the Northwest. The event was close to a sellout, and attracted a variety of coverage from local media. Thanks to all ten of the participating businesses (see list below) that helped to make this event possible. This was the 12th Caffeine Crawl in less than two years, but the first time a green coffee importer, Cafe Imports, and a chai company, Gray Duck Chai, were added to the Crawl. Along with TeaSource, these three businesses added a nice balanced Crawl. Crawlers took home goodies in their event packets, including a variety pack of natural sweeteners from Wholesome Sweeteners, Rip Van Wafels to go with your morning coffee, a sample pack of loose leaf teas from TeaSource, the newest issue of Barista Magazine, a coffee sleeve from Sleeve A Message, a bag of coffee from Dogwood, and a certificate from Peace Coffee to redeem for a free pint glass. Lots of great coffees and demonstrations were showcased, too. Quixotic touched on coffee defects and did a side by side so the attendees could learn more about coffee processes and the nuances of a bean. J & S Bean Factory shared a cold brew of a Guatemala, Ethiopia and Java blend with a bag of locally made cinnamon twists. Sebastian Joe’s delivered summer in a cup with affogatos. Publika created a tasty concoction with a lavender infused cold brew using Dogwood’s bottled Zamboni and Wayne at Bull Run highlighting their selection of single origins. Roasting sponsors Peace Coffee and Dogwood covered roasting, offered a tasting and hosted their stop in their roasting facility giving Crawlers a unique, backstage tour. After visiting six stops along each route, many headed to the After Crawl raffle at the Common Roots Cafe. Peace did a great job working with Common Roots and Fulton Beer Co. to host us and offer everyone a free pint of Peace and Fulton's Collaboration brew, War and Peace. All proceeds for the raffle went directly to Books For Africa. It was nice having Maggie there with us and having the chance to learn more about this locally based organization. The top raffle prize was a Baratza Vario-W grinder won by Timothy Pellizzer of Sebastian Joe's. Sponsors and shops like Unic/ Stella di Caffe, The LAB, Peace, Barista Magazine, and Publika donated items to the raffle. This event will grow each year with the addition of a bike-friendly route, and more shops. We'll see you in June 2013, Twin Cities!